Cleopatra Records electrorock/dubsteb artist Blackburner has just been tapped to support MINISTRY on its summer 2012 national tour. 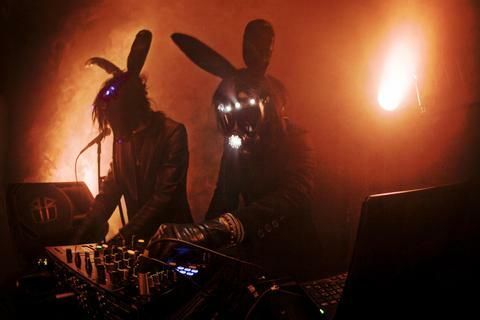 Blackburner is a bold new force in electronic music, combining the heavily twisted and seriously aggressive beats of dubstep and glitch with the melodic hooks of rock, industrial, and electronica. It is masterminded by producer/musician Skyla Talon, a Michigan-born Los Angeles transplant who cut his teeth with the modern metal band Killingbird and later joined Scum Of The Earth with former Rob Zombie axeman Riggs. Inspired by the revolutionary new sounds in electronic music generated by the likes of fellow metal-head-turned-DJ Skrillex, Talon began the Blackburner project remixing tracks and releasing original compositions through the Cleopatra imprint Hypnotic Records. The project immediately met with enormous success, as compilations featuring Blackburner climbed the iTunes Electronic charts, racking up over 50,000 individual downloads. Now joined by former Chicago-based metal musician K Kyle (who also performs in hard rock band ModelSaint with Talon), Blackburner is preparing to release a full-length record in April 2012. FEEL THE BURN will feature guest appearances by Edgar Froese of electronic pioneer Tangerine Dream as well as John Wesley of Porcupine Tree.